Alan Grant and Alan Burrow's legendary 'Funguys' gatecrash the Last Supper, with sobering consequences. A lowly cleaner deals with major abandonment issues after everyone in the entire world leaves for a different time line, in 'Time Waits' by David Hailwood, Gary O' Donnell, Anne-Marie-Webb and Ken Reynolds. An alcoholic orc and his overweight companion attempt to tap into the unexplored market of Beer Beards in 'Rubbernorc: Vital Delivery' by Paul Eldridge, Brett Burbridge and Ken Reynolds. A caveman discovers the future's not all it's cracked up to be in 'Wrong Time, Wrong Place' by Chris Sides, Rory Donald and Ken Reynolds. 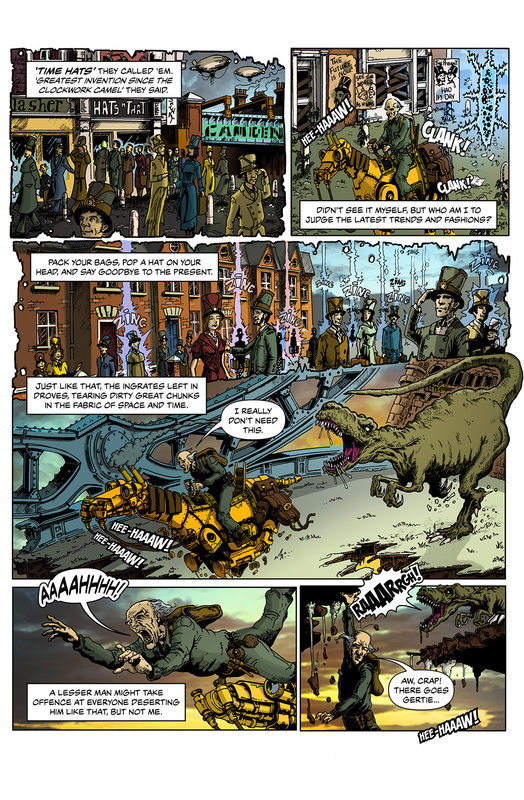 Steampunk scientists attempt to cook up a popular new alternative to the Pseudo Lab Rat in 'Pet Peeve' by Ken Reynolds and Jordi Perez Estevez. Up against a deadly alien peril, the crew of the Skow unleash the full might of their secret Scottish weapon in 'Skowdogs' by John Freeman, David Hailwood, Dave Thomson and Ken Reynolds. On a vastly overpopulated earth, two government agents attempt to keep the population in check and rack up a hefty kill bonus in 'Supply and Demand' by David Hailwood and Tony Suleri. An android underdog bites off more than he can chew in 'Rumblebot Rampage' by Tim 'Comicsy' West and Edward R. Norden. A security operative on the late shift begins to suspect strange things are afoot in 'Elevator' by Tomek Kontny and Mikolaj Ratka. A nervous rabbit fears the universe is out to get him in 'Tense' by Pablo Iten and Ktaiwanita.